There's abundant warmth, humor, and heart in this charmer, and readers will root for both characters and pumpkin. A winning debut. In a warmhearted debut novel, Hill shows what happens when a serious-minded girl is forced to reevaluate her priorities and reach out to others...Offering distinctive characters, a relatable plot, and some useful gardening tips, Hill’s story promotes connectivity in neighborhoods and communities. The book is a bittersweet tribute to the experience of growing up in a close-knit neighborhood; characters are written with care and depth...Fans of Sharon Creech’s Moo and other books about intergenerational friendship will enjoy this book. The story is filled with a diverse cast of characters, and the twins live in a multi-generational household...music lovers will connect with Rose, and readers who make it to the end will be rewarded with a satisfying finish. This book is an easygoing title, highlighting the stress that goals of perfection can bring. Readers will love just how particular and grownup Rose tries to be, rejecting any bit of frivolous behavior, and they will find comfort as her community helps her ease back into the joys and simplicities of life outside of music. This debut novel is a creative account of one 12-year-old trying to figure out what defines her and how she can still be herself if one of her defining traits is taken away...the conclusion is sweet and satisfying. This is a must-read for music lovers, math enthusiasts, and all who extend the boundaries of their families to their whole block. A variety of subplots—an elderly Japanese neighbor introduces the tea ceremony and the concept of kintsugi, mending with gold; a con man convinces the group to enter the pumpkin in the Minnesota State Fair— add depth to the novel, and Rose’s earnest struggles with her precocious appearance and oddball tendencies keep a unique character from descending into twee quirkiness...Hill delivers an emotionally resonant story. 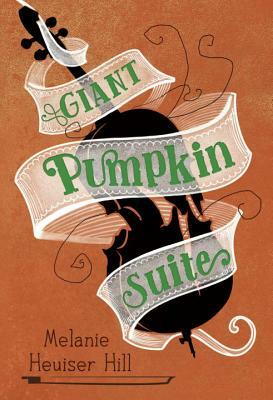 Rose is focused on winning the upcoming Bach Cello Suites competition and her happy-go-lucky brother has taken up the challenge of growing a giant pumpkin in the yard of their elderly neighbors. When a serious accident occurs, Rose has to grow and change in ways she never expected. Expect: tap dancing, classical music, mail-order worms and the Minnesota State Fair.